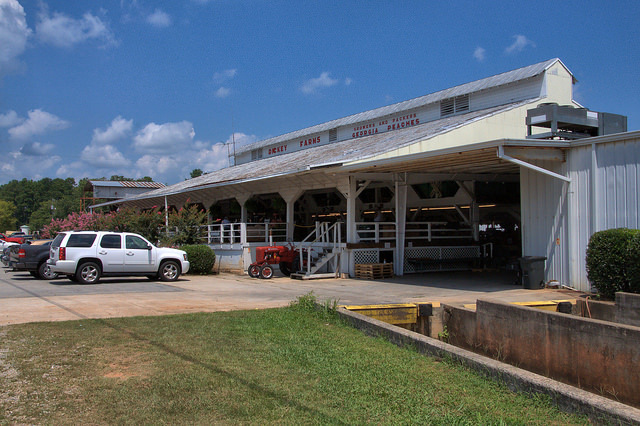 The packinghouse at Dickey Farms is the oldest continuously operating facility of its kind in Georgia. Built in 1936 from lumbers hewn on land owned by “Mr. Bob” Dickey, it’s the most prominent structure in Musella and a real icon of Georgia’s most famous crop. 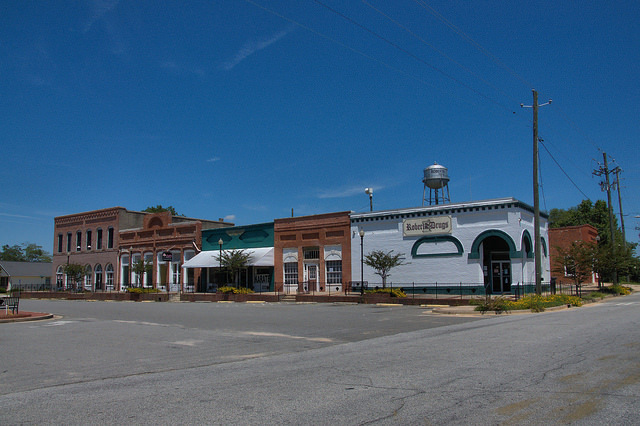 It’s not an exaggeration to say that it’s the center of life in this friendly little Middle Georgia town. 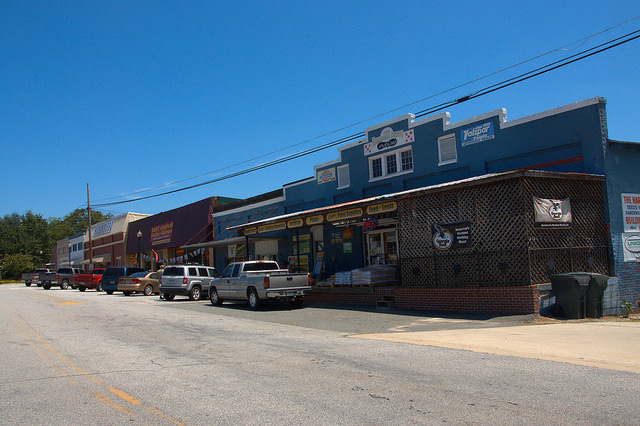 If you pass through here when peaches aren’t in season, you might think it’s a ghost town, but when they are in season, it’s like a small metropolis. Everything here revolves around peaches. 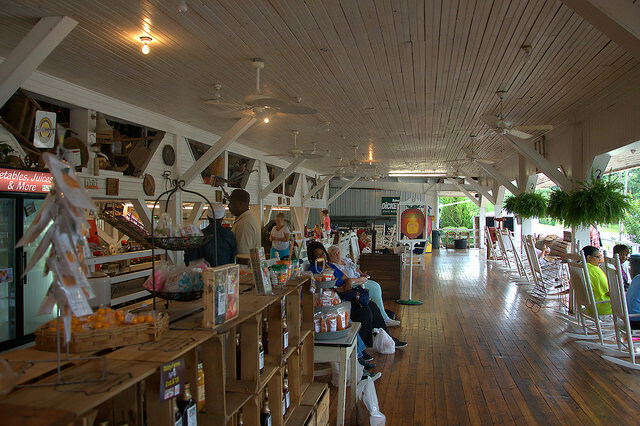 The season runs from the middle of May through the second week of August and Dickey Farms is open seven days a week. When I walked onto the “porch” at the packinghouse I was greeted by baskets full of these beautiful June Princes, a variety of Semi-Freestone that gets plump and sweet around the 10th of June. A bit of history from the Dickey Farms website*: Robert L. “Mr. 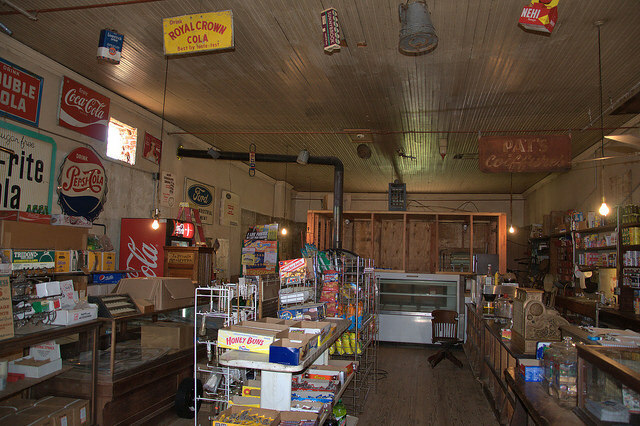 Bob” Dickey was an early pioneer of “multi-tasking”, being a postmaster, undertaker, depot agent and general store manager. However, his heart was in the peach industry, and we are reaping the rewards today. In the early days of Dickey Farms mules were used to plow the orchards and also for transportation of peaches to the packinghouse. At that time, most of the work was done manually. However, “Mr. Bob” was a forward-thinker, always wanting to introduce labor saving equipment. He installed Georgia’s very first brushing machine to remove the peach fuzz. 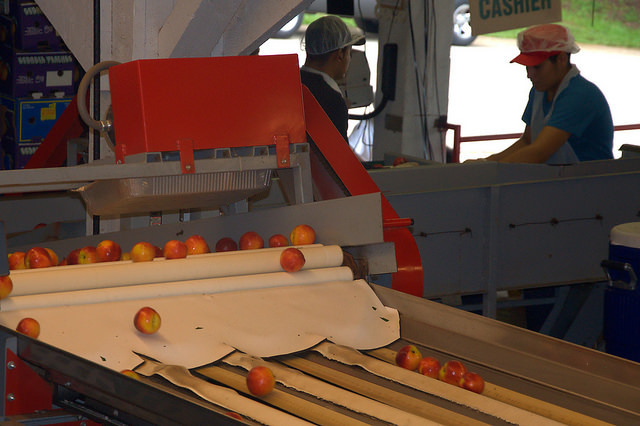 He was also one of the first producers to include a hydro-cooling system that places peaches in 35-degree water to remove field dust and slow the ripening process, making them perfect when reaching the northern markets. Today, his grandson, Robert L. Dickey, II and his great-grandson, Robert L. Dickey, III, work together to ensure that a Dickey Farms peach is the freshest, most succulent fruit available. While “Mr. Bob” shipped all his fruit by refrigerated railroad cars, peaches today are shipped by refrigerated trucks, which can reach some markets overnight. Although many changes in the industry have been made over the last 100 years, the Dickey family still continues the tradition of providing the highest quality peach. 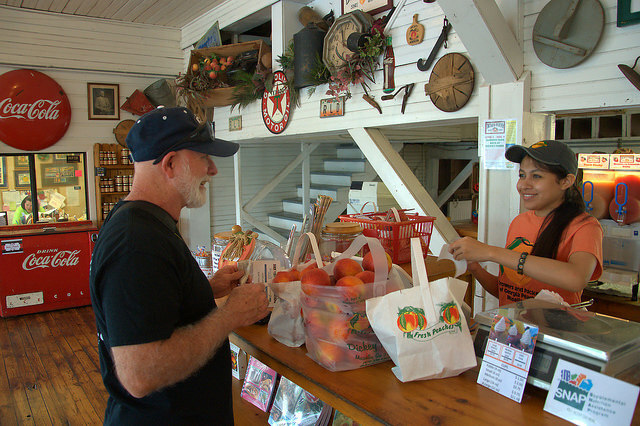 * Though the packinghouse dates to 1936, Dickey Farms has been involved in local agriculture since 1897. 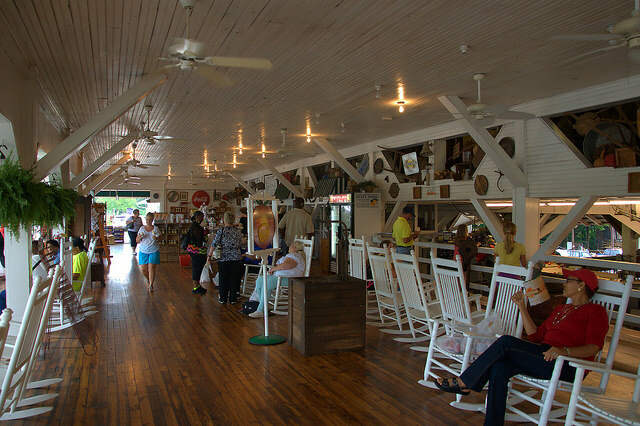 The “porch” is filled with old-fashioned rocking chairs and plenty of ceiling fans. 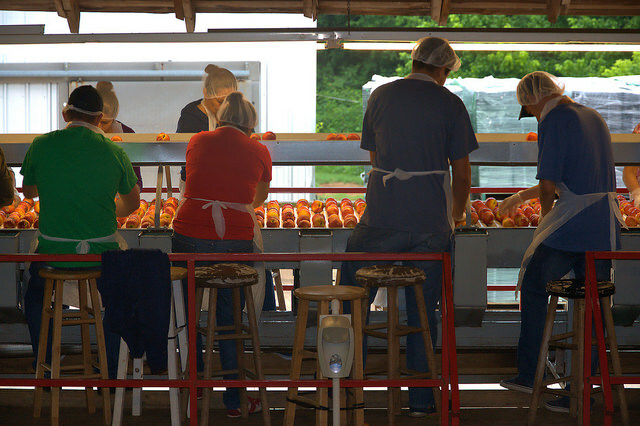 Numerous products made with Dickey Farms’ Georgia peaches can be found throughout. I bought pickled peaches, peach preserves, peach gumballs for the kids, and my friend bought some peach bread and syrup. 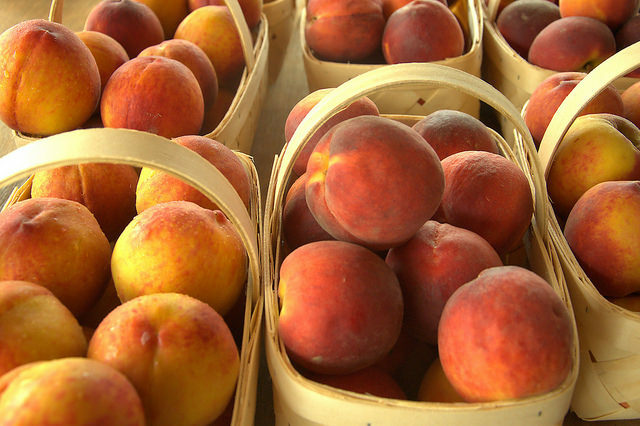 If you love peaches, Dickey Farms will not disappoint. 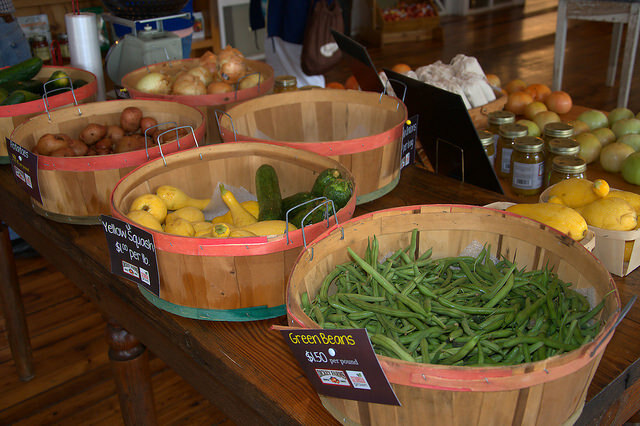 Fresh local produce is also for sale when available. 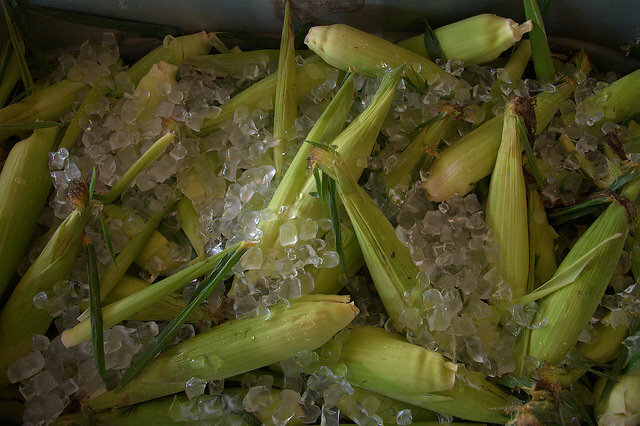 The sweet corn looked really good. And though the peaches are the main attraction here, the grading, sizing and sorting operation is a wonder in itself. 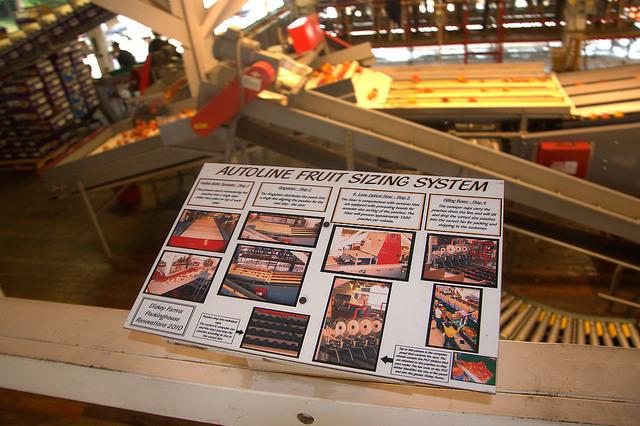 The Autoline Fruit Sizing System, renovated in 2010, begins by maneuvering the peaches into a single layer instead of piled atop each other, then lining them up in single rows so they can be sized. 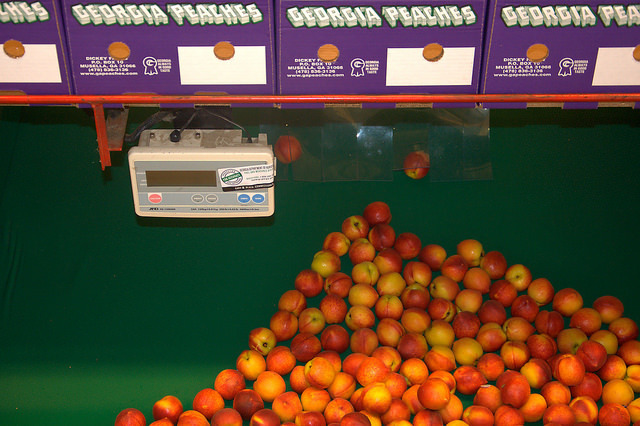 A computerized optical sizer sorts the peaches and distributes them for packing into awaiting boxes. Even with mechanization, the peach industry is still quite labor intensive. It’s amazing to see such a process. So many people only know food as something from the grocery store, but at this packinghouse, everyone gets a lesson of how much work goes into our food supply. 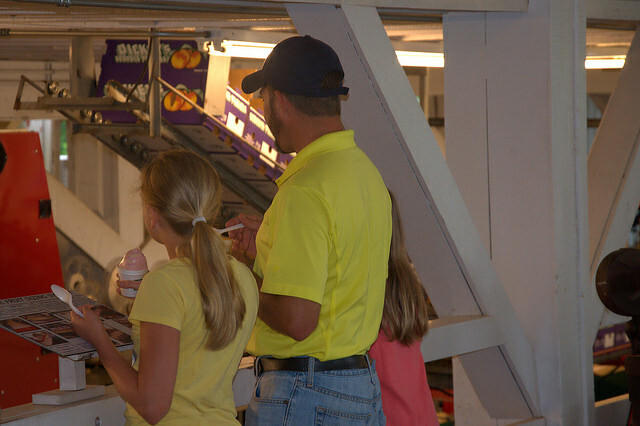 I noticed this father and his daughters enjoying the view with some homemade peach ice cream, one of the most popular products at Dickey Farms. Just don’t forget your peaches! The employees are all very friendly and courteous and can easily answer any questions you might have. This place is a real treasure. 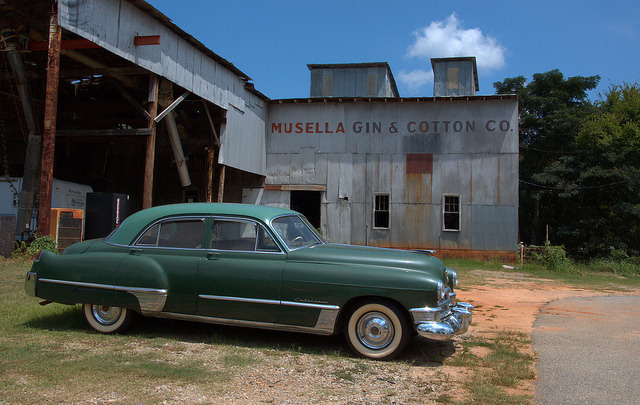 Visit the website for specifics and directions to Musella, as well as information on specific varieties and ripe dates. And if you can’t make it to Musella, you can order directly from Dickey Farms online. A marker at the caboose is dedicated to the memory of Clarence Moseley “Ribs” Peel (8 November 1897-8 October 1955) and his wife Jessie Blackwell Peel (5 May 1907-18 October 2001). 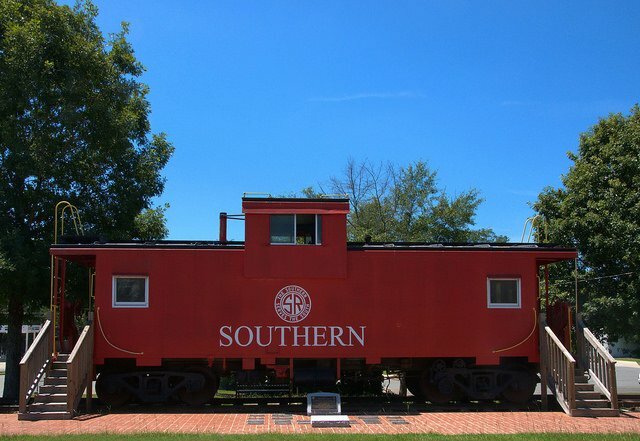 Mr. Peel, who was a trainman with the Southern Railway for 38 years, died in a railroad accident near Hazlehurst. After receiving information (which later proved to be incorrect) that another train was fast approaching his, he made the supreme sacrifice of staying with his train so that his co-workers could disembark and be safe. Mrs. Peel considered this spot hallowed ground as her husband spent so much of his career here. The moving memorial was placed by their children, Bettie Jane Rigdon, Claudine Peel, Juanita Goodson, Carlise Moncrief, and Claire Mattox, in 2010. 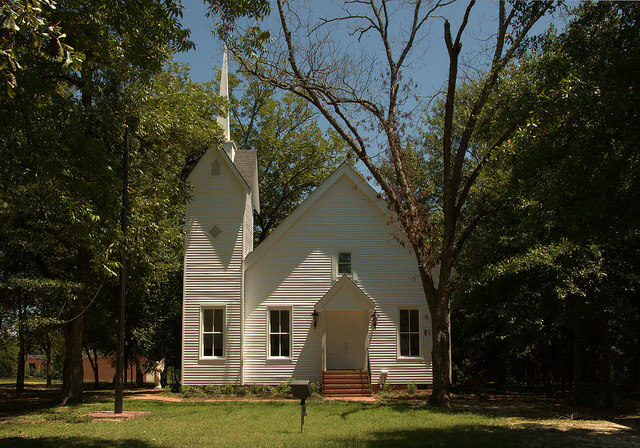 Presently known as the Lindsey Building and is used as the Roberta-Crawford Civic Center, this building was originally located in Musella and served as the Methodist church there. Thanks to Beth Paul and Frank Spearman for the identification. Mr. Spearman writes that Reverend Jim Hamlin notes it was de-commissioned years ago. Maurice Lindsey’s family were the last surviving members. Maurice, a rural mail carrier, died years ago and his wife, Betty, died about three weeks ago. The text on the monument gives a good overview of Colonel Hawkins’ life. Some of the language wouldn’t be used today, such as referring to Native Americans as ‘savages’. 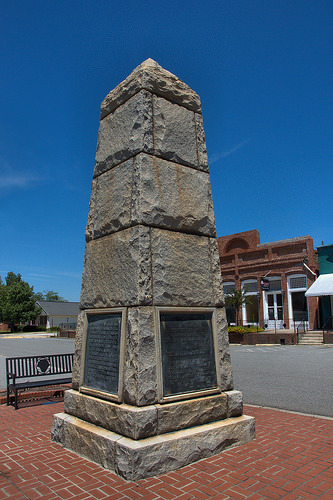 Erected in 1931 by the United States government to commemorate the life and public service of Colonel Benjamin Hawkins, who was born in Warren County, N. C. August 15, 1754 and died at the Creek Indian Agency on the Flint River, June 6, 1816. 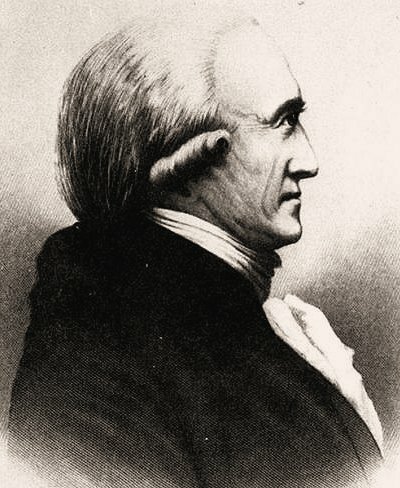 He was a student at Princeton and shortly after the beginning of the Revolution became a member of General Washington’s staff with the rank of Colonel, serving with distinction throughout the war. He was one of the first senators from North Carolina and was conspicuous for his interest in Indian affairs. Colonel Hawkins was asked by General Washington to assume jurisdiction over all the Indian tribes south of the Ohio River. At the height of his career he came to Georgia and established his home among the Creek Indians on the banks of the Flint River in Crawford County. He built the fort which was named in his honor on the Ocmulgee River at Macon and lived there while the fort was being erected, but his permanent home was at the Creek Agency. His body lies on a bluff overlooking the Flint River where he lived among the savage tribes for 16 years, a man of letters, a mediator of peace and faithful unto death. 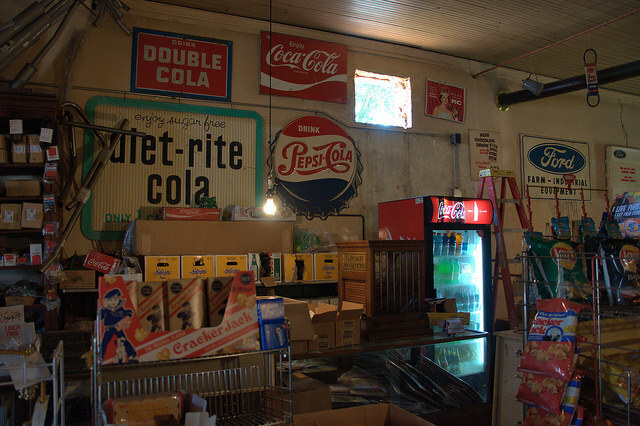 I first photographed this store in February 2010 and am just as fascinated by it today as I was then. 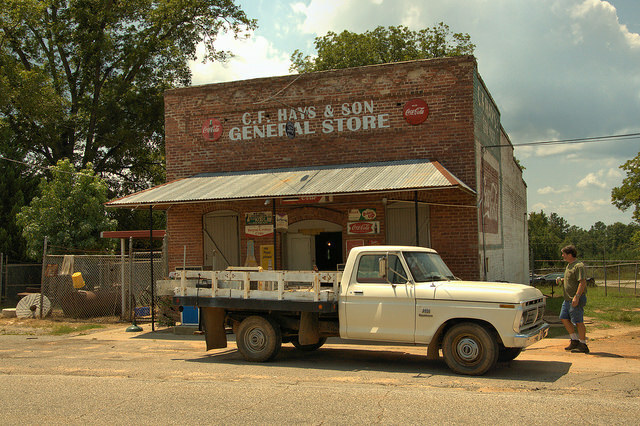 It’s been in business since 1900 and the grandson of the original owner is still operating it today. He has a real passion for the family business and its place in the history of the peach packing town of Musella. 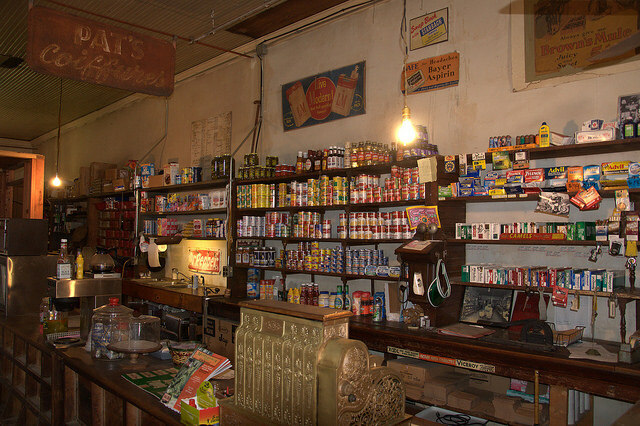 So many times I see modern “country stores” that aren’t worth their salt, but this one is authentic, as the photos below illustrate. 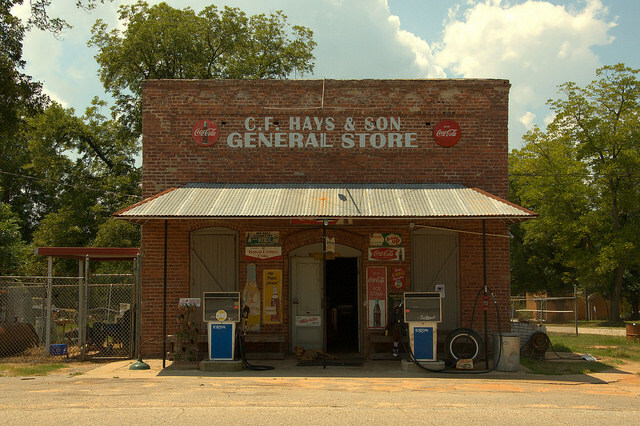 Mr. Hays, who has another job besides this one, painstakingly stocks the store with staples and various sundries and country store memorabilia authentic to the store’s history. Some would call it a hobby but I see it as an important link to the past. It’s a miracle places like this still exist. Please take the time to stop by if you find yourself anywhere near Musella. Buy an ice cold Nu-Grape or Coca-Cola in a bottle, or have some ice cream from the chest freezer. This is a classic Cadillac, likely a 1949 model.